Wayne, Pa. (July 26, 2018) —Action Technology, a Tekni-Plex business unit, recently commissioned a multimillion dollar rubber mixing system and building expansion project at its Schaumburg, Illinois, facility. The rubber compounds produced by the new system are used by Action to manufacture gaskets for aerosol valves and trigger pumps used in food/beverage, pharmaceutical, personal care, industrial and household products. 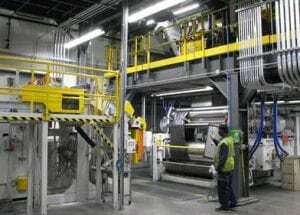 The Schaumburg project is part of Action Technology’s multiyear investment program in its European and U.S. rubber facilities to enhance supply security for global customers. “The new system offers significant benefits to dispensing pump and aerosol valve producers, as well as their global consumer packaged goods customers. We can now offer increased capacity and seamless global supply using the same technology at our U.S. operation as we have at our site near Milan, Italy. Customers will now be able to qualify a compound once and be confident that we can supply it from two global locations. Standardization across facilities is critical for multinational companies requiring a secondary supply source,” said Jim Carosella, general manager, Action Technology U.S. The new manufacturing technology is also able to provide integrated traceability, from raw material lots all the way to finished goods. This capability is particularly important for pharmaceutical and food applications where traceability is frequently mandated to meet quality standards. The equipment also includes significant safeguards which support Action Technology’s safety initiatives. “The addition of this new leading-edge rubber processing facility is another example of Action Technology’s commitment to supporting its customers—and their customers—with unmatched quality, reliability and technology,” said Carosella.